Liverpool are reportedly set to offer Daniel Sturridge a new contract with Jurgen Klopp said to be eager to see him reject a January exit from Anfield. The 29-year-old has been forced to be content with a bit-part role for the Merseyside giants for some time, making 16 appearances in all competitions so far this season while scoring four goals and providing one assist. With Klopp continuing to favour the likes of Roberto Firmino, Sadio Mane and Mohamed Salah in his attacking trident, it doesn’t seem as though the situation for Sturridge will change any time soon. 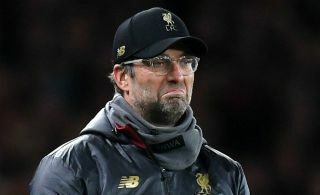 However, the Daily Mail report that Klopp wants the England international to stay at Anfield in the second half of the campaign and reject interest from AC Milan, China, Sevilla, Valencia and Inter in January to remain with the Reds. It’s easy to understand why as Sturridge still provides quality depth, and with Liverpool still competing on multiple fronts, the last thing that they will want is to be left short during the business end of the season in case of injuries or suspensions. In turn, a January exit would make little sense from their perspective, albeit they’ll have to move quickly now given the Mail add that the forward’s current contract expires at the end of the season and so if they wish to see him remain long term, a deal will be needed soon. With the chance to land a more prominent role elsewhere, Sturridge may choose to move on in the summer. However, with Liverpool pushing for a Premier League title this season, it doesn’t seem to make a great deal of sense for him to move in January either and miss out on the possibility of helping them see out the job and land a major piece of silverware.